▪Club show tickets are on sale NOW for Ticket holders with Presale Access Codes! ▪The Club Shows feature utterly insane lineups, in the most intimate of settings over 5 nights! ▪These late night shows take place on Thursday and Friday Night and AFTER the festival is over from Sat. – Mon. ▪All venues are walking distance from the festival grounds so you won’t miss a thing! ▪There will be loads of bands playing at club shows that won’t be playing the festival! ▪All VIP tickets and specific 3 Day GA passes that state Club Show Presale Access Code info at the bottom of the ticket are eligible for the Exclusive Club Show Presale. Your ticket will state whether you have the presale access. ▪Each Access Code will give you the opportunity to buy 1 ticket per show (3 shows max). This will ensure you will get the best chance of getting the club shows you want! ▪The Presale Access Code is the NUMBER UNDER THE BARCODE on your ticket. ▪If you bought multiple tickets, you should give the persons going with you there own code, so that they may access the presale and get their own tickets. This is the best way to get tickets to the same shows as your friends! ▪Single Day Festival Tickets do not include Presale Access Code. WE HIGHLY SUGGEST CREATING A SEE TICKETS ACCOUNT PRIOR TO THE PRESALE so that your information is already in the system. 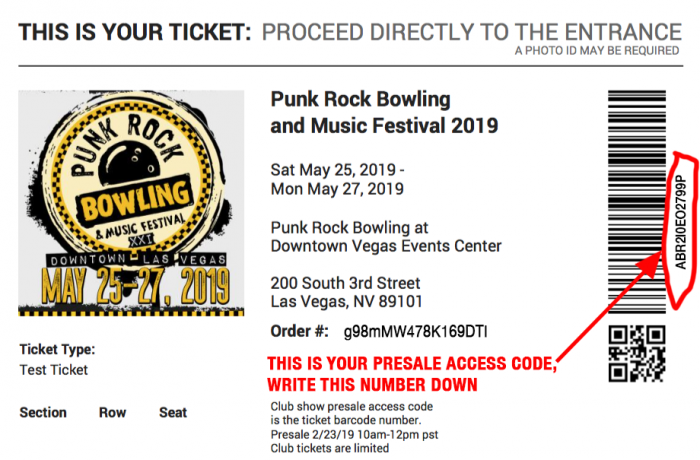 Your unique Access Code to the presale is the series of numbers located under the barcode on your ticket. You will need the Access Code to enter the site when tickets go live at 10am. Your Access Code is good for a ONE TIME USE ONLY to enter the presale where you will be able to purchase ONE (1) ticket per club show, per person, and a maximum of 3 tickets total. If you purchased multiple Festival Passes, you will need to give your friend(s) their unique access code, so they can go on at the same time and try to get tickets to the same shows you do. The SeeTickets app is also available! When tickets go on sale, the page will automatically refresh. You will be assigned a spot in line to purchase tickets. We have set up a “queue” system to control the “line”. Once you are on the club show page, you will need to enter your Access Code, then click view event. Click “CHECKOUT” and then you can either check out with your See Tickets account or you can check out as a guest, using your See Tickets account will speed your checkout time up rapidly. These shows could potentially sell out during the presale. If you are on the checkout page and receive an error message stating an item was not able to add to cart, then it is probably sold out. You can go back and add another ticket without losing the others you already added to your cart. You have 10 minutes to complete your purchase.